Hidden Kingdoms by M.A. Abraham is the first book in her new One Empire series. The good news is that many fans of the Elven Chronicles will be thrilled to return to this world, in this new spin-off series. 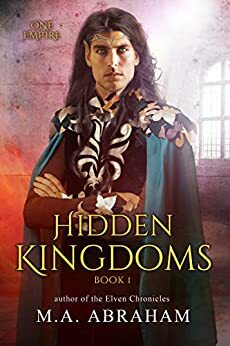 This story revolves around a quest that leads through the hidden kingdoms of the Elven Empire that were forgotten through the ages that will have you sitting on the edge of your seat. Years after the Drazon war, with the Elven Empire living in peace, and working hard to rebuild and restore from the effects of that war, the Kings are all summoned by the Oracle. The Fates have ordered a quest to save a High King, who is slowly dying. The problem is that no one is aware of the far lands they will have to travel through, which was thought to be uncharted and empty territory. We then follow a select group of the younger generation, from various thriving kingdoms of the empire, who are chosen by the fates to travel into other unknown hidden kingdoms; they will face danger and discovery on this arduous and dangerous mission. On each discovery of a different kingdom, the warriors will be meet many different elfs, as well as demon hybrids that were infiltrated into those territories. Our Elfs will help each of the kingdoms to erase the enemy, as well as enlighten them on how much has changed in the Empire after the Drazon war. Hidden Kingdoms was a great start to this new series, which allows us to look forward to future books with those we meet in this book, as well as our favorites. M.A. Abraham’s trademark of exciting adventures, fun bantering among the warriors continues in this new series, which introduces us to not only the younger generation of the Eagle Claw family, but more Kings and warriors from other unknown kingdoms that have been mostly dying over the years. If you are an Elven Chronicles fan, you cannot miss starting this new series, One Empire. You will be glad you did. 5.0 out of 5 starsAwesome new Elven Series!! This is book #1 of the new Elven series One Empire. The story takes place several years after the Drazon War. The Elves have been busy with rebuilding homes and forests and have remained unseen while doing so, until now. The Oracles has called the Council of Elven Kings to a meeting. The Fates have called for a quest from some of the younger generation with certain abilities. They will be going on an arduous and dangerous mission in unchartered lands - Hidden Kingdoms - to free the High King of the Ancients. He is imprisoned in a castle, they have to release him and bring him home. Sounds easy but unfortunately it is not. Prepare for a ride of your life! What an exciting start to a new series with plenty of action, twists and turns and humor. Grabs you from the beginning until the end and I couldn't put it down until I finished. I just love this author's stories and can't wait for the next one!! So highly recommend.